Photo by Chris Bosak A red-shouldered hawk perches on a wire in Brookfield, Connecticut, Jan. 2018. September is an exciting time in the bird world. The fall migration is well under way and that means south-bound ducks will be passing through any week now. The duck migration is the highlight of my birding year, and September is when anticipation builds before they start arriving on our ponds and lakes sometime in October. Resident wood ducks, however, are back in their gaudy breeding plumage and quite visible this month. Songbirds and shorebirds are now pouring through New England on their way south even as we wait for the ducks to arrive. It is exciting to think that many of the birds visiting our yards are first-year birds. They didn’t even exist during the spring migration. Let’s hope they make it back next spring. Of course, the most popular September birding activity is going to a hawk watch, which take place at various points throughout New England and the country. Mid- to late-September is the time to see great numbers of hawks flying south. The hawk watches continue all the way into November, but don’t miss out on the September rush. Visit any hawk watch site, such as the one at Pack Monadnock in Peterborough, and experts will be there to let you know what is flying overhead. In fact, the experts will pick out and identify the bird when it is a mere speck in the distant sky. For those who prefer their birdwatching closer to home and, indeed right at home, September is also a fun time to watch the feeders. The regular birds will be there, but some surprise visitors may show up as well. It was autumn a few years ago when a small flock of pine warblers visited my feeders daily for about a week. Warblers are not typically seen at feeders, so it was a memorable week for me. Then there are the hummingbirds. I have written about them for the past two weeks, but they deserve at least a sentence or two in this column as well. I have heard from many readers that their hummingbirds are still around, but I wonder if that will be the case by the time this column goes to print. I had hummingbirds on Sept. 18, but none on Sept. 19, even though I watched off and on throughout the day. I am hoping a late migrant or two will show up in the next few days. Fall and even into winter is when some “rare” hummingbirds show up in New England. The rufous hummingbird is the most common western hummer to veer into New England. Two weeks ago I wrote about how it is OK to keep feeding hummingbirds into the fall as their natural instinct will guide them south when it is time to do so. That seems to be the case with “my” hummingbirds and I’m sure all the other hummingbirds passing through New England. While you are looking at your feeders, take a look at the nearby trees from top to bottom. The aforementioned warblers just may be looking for food in your oaks, maples or other trees. Also, keep an eye out for other small birds, such as brown creepers. They start to show up about this time of year as well. If you live near a lake or anywhere there are bright lights, such as a stadium or high school field, now is the time to look for nighthawks. You will recognize them because their silhouette and flying pattern is different from most birds we see. They also have white bars under their wings, which are visible when they are flying. With so much going on in September you never know what you are going to see. Drop me a line and let me know what’s going on in your birding world. A scarlet tanager perches in an oak tree in Danbury, Conn., spring 2018. The colors just keep on coming this spring. I’ve been lucky enough to see two indigo buntings, three rose-breasted grosbeaks (although two were males fighting each other), a scarlet tanager, at least three Baltimore orioles, a pair of ruby-throated hummingbirds and a handful of warblers in my yard so far this spring. It’s been a welcomed color bonanza after a long winter. Now that Memorial Day has passed and we are unofficially in summer, let’s look at what some readers have seen. Carol from the Monadnock Region sent a photo of an oddly colored hairy woodpecker. Instead of the traditional white and black, this one was black and yellowish brown. A reader from Connecticut sent me a similar photo a few years ago. My guess is that it is a normal hairy woodpecker with a pigment abnormality. Pigment abnormalities show up in birds every so often, such as orange house finches or white robins. Leucism and albinoism are extreme forms of pigment abnormalities, but more subtle color variations occur. Don watched as an eagle eyed a pair of common mergansers on Granite Lake. He wondered if the eagle would try to take one of the ducks, but a loud noise distracted the eagle and it flew off. Eagles, which often scavenge for food, can take birds as big as common mergansers. Norma from Spofford had an indigo bunting visit her feeders this spring. She has been in Spofford for nearly 40 years and has seen buntings only a handful of times. It’s also been a colorful spring for Lenny of Greenfield, who has seen orioles, rose-breasted grosbeaks and cardinals. A special treat was seeing the oriole and grosbeak at the feeder at the same time. Dean in Marlborough reported visits from pileated woodpeckers, indigo buntings, cardinals and eastern bluebirds. Another colorful yard in the Monadnock Region. Lida from Harrisville had a male and female oriole come to her table to feast on oranges. Another reader suggested using grape jelly to attract orioles. I tried to attract orioles with both oranges and grape jelly this spring, to no avail. Eric in Surry noticed the usual changing of the guard for ground-feeders as the juncos left and chipping sparrows arrived, with about a two-week overlap. He has also noticed a few warbler species, including a pine warbler carrying nesting material. The material was hair he leaves out for the birds after brushing his dog. He has also seen chickadees, phoebes and nuthatches grab some of the hair. He had another interesting bird sighting this spring; shortly after filling in small holes in his yard, a Cooper’s hawk swooped in to grab a chipmunk. Eric has also seen a blue-gray gnatcatcher and heard an eastern whip-poor-will. It’s been years since I’ve heard a whip-poor-will so I’m glad someone is still hearing them. Spring migration is winding down, but not over. Soon, it will give way to nesting season. Let me know what you are seeing out there in this exciting time of the year for birdwatching. 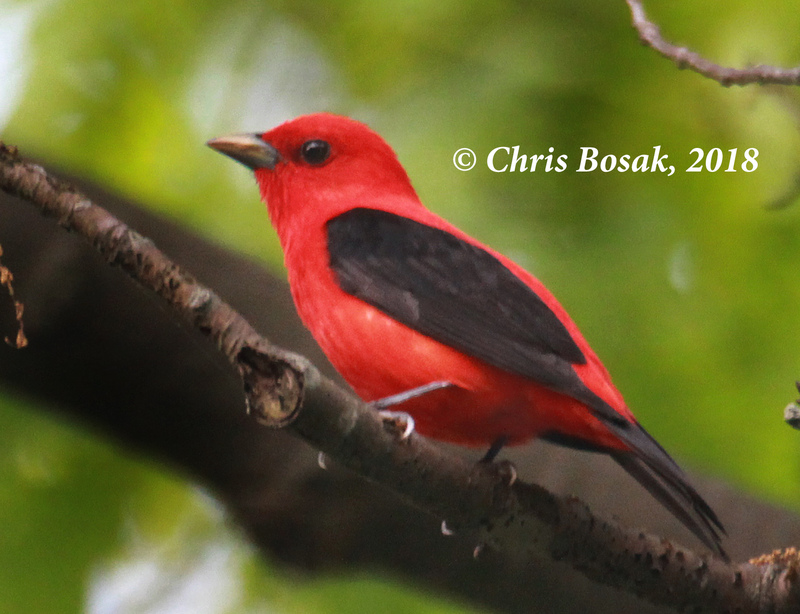 First the rose-breasted grosbeak and the indigo bunting, now this … a brilliant male scarlet tanager visits the yard this spring. Sure, it didn’t visit the feeder, but it was in the oak trees above the house. Good enough for me. Happy birding everyone. 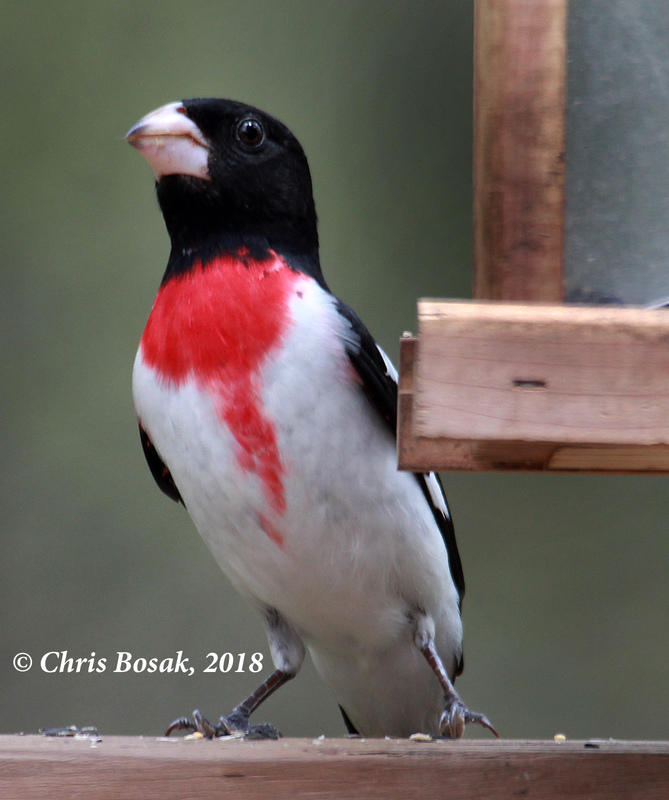 Photo by Chris Bosak A male rose-breasted grosbeak visits a feeder in Danbury, Conn., during the spring of 2018. We still have a few weeks left of peak spring migration, so this list is not inclusive (I hope not anyway), but the feeder has been active recently with the following birds: rose-breasted grosbeak (male and female); chipping sparrow; goldfinch; gray catbird; blue jay; cardinal (male and female); indigo bunting (first spring male); red-bellied woodpecker; white-breasted nuthatch; tufted titmouse; black-capped chickadee; downy woodpecker; hairy woodpecker; mourning dove; house finch; ruby-throated hummingbird (male and female); wild turkey; and probably one or two more that aren’t coming to mind at the moment. I bought a new oriole feeder, but no luck yet with that one. What’s been visiting your feeders? Feel free to comment with your list. 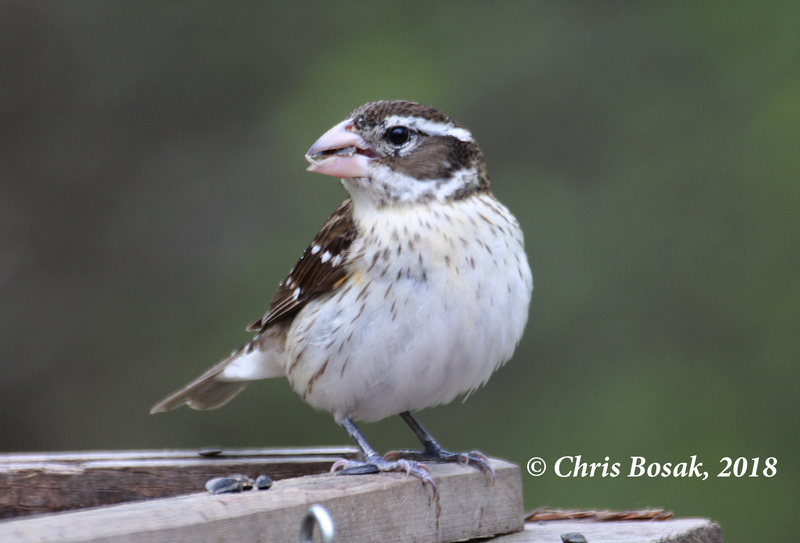 A female rose-breasted grosbeak visits a feeder in Danbury, Conn., during the spring of 2018.